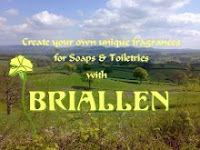 Explore the pleasure of making of your own individual scents amidst the beautiful countryside of the North Wales hills where Elaine Jones of Briallen will be holding one day workshops on the blending of essential oils to create fragrances for soap and toiletries. Saturday 9th April, 10am - 4pm. £25 deposit, payable by credit/debit card online or admin@briallen.co.uk for Paypal invoice. Size of each group - four to six people. For further details see the Briallen website.